Another blog post, another week packed with events making the national capital region a busy place. If you’re in Ottawa-Gatineau this week and have time to check out some stuff, there’s lots happening, so take a look at Eventful Capital’s weekly picks below for a glimpse into the number of events being held around town in the coming days. California Progressive Death/Grind Metal band Cattle Decapitation will be making a stop in Ottawa this Monday, September 28 as part of the North American Extinction Tour. For the occasion, they’ll be performing at Mavericks and sharing the stage with Australia Grind Metal group King Parrot, USA Metal formation Black Crown Initiate, Tampa Heavy Metal project Dark Sermon and Ottawa Death/Black Metal project From The Deep. 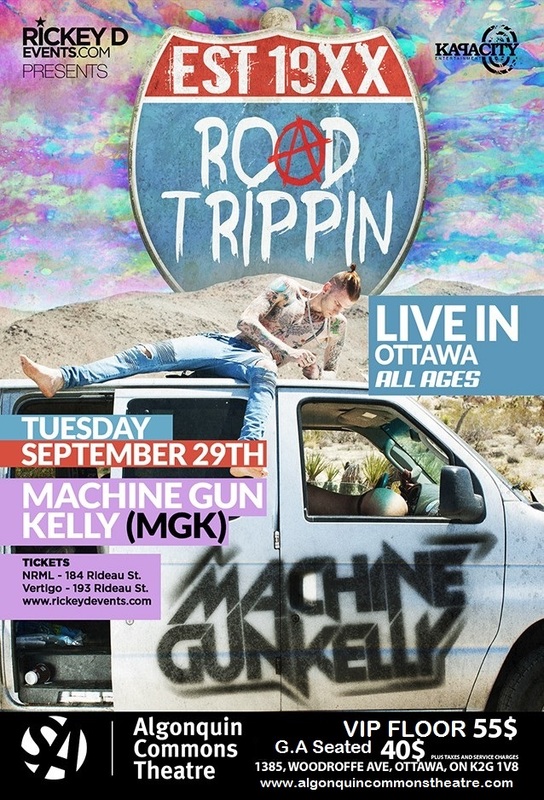 American rapper Machine Gun Kelly will be making a return to Ottawa this Tuesday, September 29 as part of the Road Trippin’ Tour and this time around he’ll be performing live at the Algonquin Commons Theatre. The Cleveland, Ohio based hip hop artist will be joined on stage by special guests Swisha T, Mace Milly and more. The inaugural Small Conference aims to discuss a range of small business topics with keynotes that each feature two speakers from different stages in their business growth candidly speaking in interview-format to compare perspectives on each topic. The event, happening this Thursday October 1 at the Ottawa Little Theatre, will include a Business Panel featuring namely Marc Doiron of Town and Steve Cody of the Better Software Company and a Music Panel featuring the likes of Erin Flynn of CHUO FM and John Thompson of The Record Centre. So apparently, people are starting to celebrate Halloween right at the start of October now, but I guess it’s as good a pretext as anything else to throw an event, right? The first of its kind spotted in Ottawa is going down this Friday night at Mavericks. It’s a live show happening as part of the One-Eyed Halloween Tour that’ll feature USA rock metal band One-Eyed Doll, Hollywood rock group Stitched Up Heart, Phoenix rockers Run 2 Cover, Ottawa industrial metalcore Greylights and more. So really, it’s more of a metal show than anything. St-Albert cheese presents the first Mac My Cheese Festival happening from October 2 to 4. The event is a celebration of all things Mac and Cheese including traditional, gourmet and exotic versions. Mac My Cheese will be held at Festival Plaza outside the Ottawa City Hall and will also feature craft beer, eating contests, and live music. For the third year in a row, restaurants and businesses in the Vieux-Hull sector of Gatineau have joined forces to offer an Oktoberfest celebration happening this weekend. There will be a bavarian menu, live music, entertainment and, of course, beer. Beau’s All Natural Brewing Co. is holding its annual Oktoberfest celebrations in Vankleek Hill this Friday, October 2 and Saturday, October 3. Not only can you sample a variety of 14 craft brews at Beau’s signature fundraising event, you can also try the Bavarian inspired cuisine, enjoy family-friendly activities and see some live music from Yukon Blonde, Alvvays, Fucked Up, The Pack AD, The Elwins and more. Oh and Tom Green will also be there. Halloween-themed event sighting #2: a free screening of Tim Burton’s The Nightmare Before Christmas. The event, being presented by Capital Pop-Up Cinema and the ByWard Market, will be held at Al Fresco in the market ad is open to all, including your lawn chairs. Megan Miller is an Ottawa native playing with the American band And The Kids, but is dealing with some immigration issues to head back to the States and so there’s a show happening on Friday at Pressed to raise some dough to help her get back to her band and keep making music. The event will feature Megan playing as part of Valois, Nathan Tappin doing projections, Ottawa group Future States, and Portland, Oregon group Mandarin Dynasty. Looking for an intimate night of mellow music this Friday night? I suggest checking out Raw Sugar Cafe to see Toronto folk pop singer-songwriter LUKA, Ottawa ambient pop rock musician John Hynes and Ottawa experiemental dream pop folk project Heron’s Wake perform live. If you’re into indie rock and want to support some Ontario bands, make your way over to Avant-Garde Bar this Friday night to catch Ottawa Surfadelic Rockers Blve Hills, Burlington Indie Rock band Big Lonely, Ottawa indie garage pop grunge trio Elementals and North Bay Experimental Indie group David Dino White and The Vista Cruisers. Over at the Mercury Lounge this Friday, Canada’s premiere soul and funk label Do Right! Music bring you The Soul Motivators’s album release party for their debut full-length “Free To Believe”. For the occasion, the Toronto-based soulful funk 9-piece will be joined by DJ Lance Baptiste. If you’re looking to mix live music and a night of dancing, this is a sure bet. Looking for a night of dancehall, roots, foundation, and lovers reggae? Look no further than Higher Level. DJs Magnificent and Select have got the perfect party for you at City Nightclub this Friday night and they’re also celebrating the event’s one year. The two Ottawa friends have joined forces to bring you a solid dancehall/reggae dance party and this time around they’ve enlisted the help of DJ Selektah Shellz to keep the dancefloor bumping. Happy birthday Higher Level! Kansas City hip-hop artist Tech N9ne is making a return to Ottawa this Sunday, October 3. The founder of the Strange Music record label, who’s no stranger to Canada’s capital, will be performing live at Ritual as part of his Special Effects Canadian Tour. This time around he’ll be joined on stage by special guest Krizz Kaliko, Doug Crawford, Ottawa hip hop artist Alex Lost and others. CHUO 89.1 FM, CKCU 93.1 FM & Birdman Sound present the 13th Ottawa Community Record Show this Sunday, October 4 at St. Anthony’s Hall. This is the place to go to find LPs & CDs and dig for rare music gems from every genre. A must for music collectors! Another blog post, another week filled with events making the national capital region’s a busy place. If you’re in Ottawa-Gatineau this week and have time to check out some stuff, there’s a bunch of things happening, so take a look at Eventful Capital’s weekly picks below for a glimpse into the number of events being held around town in the coming days. Konvict Music’s own Akon will be making a return to the National Capital this Tuesday night as part of his Pre Stadium Album Release Canadian “Promo” Tour. For the occasion the Atlanta-based hip hop artist be performing live at the Bronson Centre and he’ll be joined on stage by special guests Karl Wolf, B.A.E. and Peter Jackson among others. US indie punk/rock band The Ataris are performing live at Mavericks this Tuesday night and for the occasion they’ll be playing Blue Skies, Broken Hearts…Next 12 Exits in its entirety. As part of the show, they’ll be joined on stage by pop punk/ska group Survay Says!, Ottawa punks Remember The Fire and Ottawa indie alternative rockers Housebound Gypsies. IoT613 is a two-day conference happening this Thursday and Friday in Ottawa dedicated to the Internet of Things. It’s a hands-on event and will explore how IoT will shape the future of our daily lives, businesses, and governments. If you’re an artist, a teacher, or if you’re just looking for arts & crafts/DIY supplies, you should check out the Ottawa School of Art’s Annual Garage Sale being held this Thursday, September 24 in the school’s lower lobby. There will be art supplies, books and a little bit of everything. The One World Film Festival, Ottawa’s longest-running annual documentary film fest, is back for a 26th year and happening from September 24 to 27 at and the National Gallery and Saint Paul University. With an aim to raise awareness on social justice, human rights and environmental issues through thought-provoking documentaries, the festival will feature films on global issues as well as engaging discussions, workshops, and a festival fair. If you’re into post metal, you should make your way over to Mavericks and Cafe Dekcuf this Thursday night for a night of live music in two venues featuring 7 bands. The bill includes Paris atmospheric post metal group Alcest, USA black metal band Abigail Wiliams, LA rockers Emma Ruth Rundle, USA noise formation Today Is The Day, and Ottawa experimental project Destroy Clocks. Montréal-based indie folk rock singer-songwriter Elliot Maginot will be giving an intimate set at Raw Sugar Cafe this Thursday night. The musician, who recently performed in Gatineau as part of the FOÉ, creates beautiful alternative folk tunes with layers of vocals and infused in moody dreamy pop and he sounds just as good live, if not better, than on record. Canadian rap veteran Madchild will be making a return to Ottawa this Thursday night and performing live at Babylon. This time around, the Swollen Members hip hop artist from BC will be sharing the stage with special guests Demrick, Swisha T, and Adlib among others. This Friday, September 25, Ottawa celebrates its love of bicycles with Capital Velo Fest taking place outdoors in front of the Ottawa City Hall to start. The 2015 edition of this bike festival will feature a 20km night ride under the stars including live music and animation along the route. As part of the One World Film Festival, there’s going to be a LGBTQ Election Debate with candidates from the 4 main federal parties at the National Gallery of Canada this Friday, September 25. The event will kick off with the screening of The Year We Thought About Love and will be followed by the debate. Anomaly Vol. 5 is happening at House of Common this Friday night. Audio sounds will be provided by Telephone Maison and Birds of Paradise while Hard Science and Mawt Trood will be handling the visual projections. Hottowa is back this Friday night with a special edition happening behind Mill Street Brew Pub in a courtyard by the water. The dance party will feature VJ Paradise, DJ Mykro Toys, DJ GloryHull, DJ Lamb Rabbit and DJ SMILES playing all sorts of stuff from disco, funk, synth pop, rnb, hip-hop and more. Orlando, Florida garage punk/pop band Wet Nurse will be giving a live show at House of Targ this Friday night as part of their So It Goes Tour. The 3-piece will be sharing the stage with Ottawa garage rockers Nightshades fresh off of their Marvest performance and Ottawa blues pop trio Coccinella. For the September edition of Party Pack, special guest DJ/Producer Hoodboi will be back in Ottawa to give a live set inside Multi Social Room. The LA-based Fool’s Gold signee will be receiving local support from Foster, Laocapone, Greege and Yashavelli. If you’re into trap, hip hop, and 90s throwback anthems then you should enjoy this. Double Barrel, one of Ottawa’s most popular monthly dance parties, is going down inside Mercury Lounge this Friday night. Resident DJ Magnificent will be gracing the wheels of steel as per usual and this time around he’ll be joined by special guest DJ Ruby Jane. A funk, soul, Motown and vintage reggae dance party you don’t want to miss! Local alternative folk musician Lora Bidner is having an Album Release show for her project To The North this Saturday night at Live on Elgin. It also happens to be her birthday that day, so she’ll be celebrating both as well as performing live and releasing a music video for one of the songs. Hometown favourites The Souljazz Orchestra are performing live at Babylon this Saturday, September 26 to officially kick off their Resistance International Album Release Tour. The Ottawa-based six-piece, known for its contagious soul, jazz and afro-latin sounds, will be joined by DJ Zattar on the wheels of steel. If you miss out, you can also catch them at the Petit Chicago in the Hull sector of Gatineau on November 14. 3 days of live music outdoors, camping, a bike race, runs, musical chair, a rock paper, scissors tournament, unplugged sets and more, that’s Neat in the Woods. Happening just outside of Ottawa in Burnstown, the entertainement-packed event will feature live performances by The Trews, Matt Andersen, MonkeyJunk, Ben Caplan & the Casual Smokers, Silver Creek and more. If you’re remotely in tune with the National Capital Region’s cultural scene, you may have heard a thing or two about the Festival de l’Outaouais Émergent, that is, of course, if you don’t turn your back to what goes on across the bridges that separate Ottawa and Gatineau. Affectionately dubbed the FOÉ, this local festival that strives to give center stage to emerging artists from the region and beyond, will be presenting its 8th edition from September 10 to the 13. Throughout the years, the small festival has incontestably become a key event that’s helping to put Gatineau on the map as a growing hub for the arts. It’s also contributing to the revitalization of the heart of downtown Gatineau, a popular sector just a stone’s throw away from the Nation’s Capital, which is slowly, but surely getting a much-needed facelift. Music journalists and enthusiasts alike will agree that catching Milk & Bone live is a must. The Montreal-based duo has been gaining momentum this past year with the release of their debut album Little Mourning, a first record that was long-listed for the Polaris Prize no less. I had the pleasure of discovering Milk & Bone at the FOÉ last year at what turned out to be one one of their first performances ever, and I was immediately captivated by their soothing electro-synth pop melodies. Right then and there, I knew these girls would blow up, and sure enough, a year later, they just keep rising. Seeing Timber Timbre live is almost a trance-like experience. The band typically performs with very little lighting to avoid visual distractions and create an atmospheric ambiance, which gives the audience no choice but to absorb the band’s cinematic moody indie folk rock sound. It’s a nice change from the flashing lights that we’re often bombarded with and very appropriate given the group’s approach to music. If you expect a high energy and lively set, you’ll be sorely disappointed. However if you enjoy the haunting and mesmerizing, make sure you catch Timber Timbre. If you’re into hip hop, do yourself a favour and go see Koriass, you won’t be disappointed. The Quebec rapper straight outta St-Eustache has been around the block and it shows through his rhymes and flow. An influential part of the Rap Queb game for over 14 years, Korey has racked up awards and recognitions left and right, proving that he’s become a staple of Francophone rap. Montreal punk rock veterans Grimskunk have undeniably paved the way for today’s Canadian punk rock scene and, although they’ve slowed down the pace in the past years, they still know how to party and their live shows are straight Madness…in a good way! If you enjoy punk mixed with a little bit of ska and reggae and are up for a rowdy good time, you certainly won’t regret catching their set. Elliot Maginot has been on my radar for a couple of years now following the release of his single Monsters at War. The Montréal-based indie singer-songwriter creates beautiful alternative folk tunes with layers of vocals and infused in moody dreamy pop. Although he’s still quite underrated, it’s only a matter of time until he gets recognized on a bigger scale. Another Polaris Prize long-listee featured as part of this year’s lineup is none other than the talented Pierre Kwenders. The Montréal-based self-proclaimed Bantou emperor with roots in the Congo, has single-handedly created a new genre of afro-pop music that merges traditional sounds from the Motherland with contemporary ones. He’s fresh, he’s fun, he’s charismatic and he knows how to get people moving. Having seen him twice this year, I can affirm with confidence that he’s one you don’t want to miss. Ottawa’s own Mackenzie Rhythm Section is gaining a reputation for itself thanks to its energetic live shows, charismatic band members and contagious funk, soul and rock n’ roll. Their performances are basically a guaranteed good time and with their forthcoming album set to come out soon, their FOÉ appearance is bound to be another fun and memorable dance party. The name alone is intriguing, and the music in a class of its own. Scattered Clouds aren’t afraid to experiment with weird and moody sounds and that makes them stand apart from everything else coming out of the National Capital Region these days. It’s film-noir-esque, it’s dark and it’s superb. Catch their set on September 11 at 6:45 pm at the main site. Aylmer-based newcomers Chérie have only been around for the past year or so, but they’re already being noticed and compared to the likes of Daughters, which is promising for the folk pop duo turned-four-piece. Their simple approach to music doesn’t take away from their charm. The leader singer’s soothing voice is an instant catch and that alone will have your ears begging for more. A proud ambassador of his native 07 region, D-Track has become a true wordsmith over the years. The Montréal-based rapper and spoken word artist has an ease with words that is hard to come across. He delivers intelligent hip-hop and is quite gifted when it comes to rocking the mic for a live public. This time around, he’ll be presenting pieces from his debut spoken word album. It’s always a pleasure to have D-Track back! And there you have it: Eventful Capital’s top picks for this year’s FOÉ. For more details on programming or tickets, visit the festival’s official website.